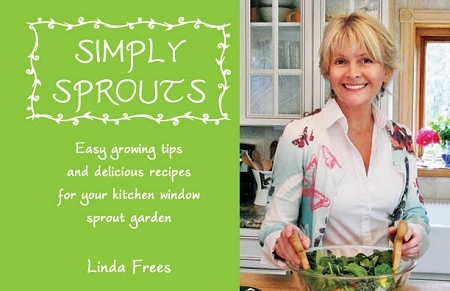 Linda Frees (Hippocrates Health Educator, Living Food Instructor, and TV personality) has been growing sprouts in her kitchen window sprout garden for two decades now. After trying dozens of sprouting systems and gadgets sheâ€™s come up with the simplest way to grow sprouts in any climate or space. To help others do the same she's written a new recipe book called 'Simply Sprouts'. This colorful, photo-filled book is just that. Simple sprouting instructions and easy recipes for juices, smoothies, breakfasts, salads, and desserts; all incorporating sprouts grown in your own kitchen. Recipes such as Emerald Sunflower and Avocado Soup, Sprouted Buckwheat and Fruit Smoothie, and Spicy Sprouted Bean Mix Salad are just some of the recipes found in the eighty-page, spiral-bound book. She's even got a recipe for chocolates with crunchy sprouts!